À la Poupée and the Chine Collés write and perform songs about inky fingers and broken hearts. 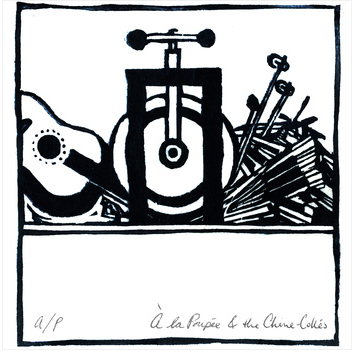 It began in the printmaking-shop of the University of Kansas when a couple of grad students started writing songs about the joys and sorrows of making prints. Their first album released in September 2013 and was titled Artist Proof. Great tunes! All songs are by Brian Hawkins & Greg Stone. Brian 'the Brayer' Hawkins is responsible for: piano, guitar, washboard, scraping and burnishing, and playing the aquatint box. He also sings. Greg 'the Litho' Stone is responsible for: more guitars, harmonica, levigating, paper tearing, inking, cleaning, screenprinting, and playing the drying racks. He also sings. You can hear all their songs, read the lyrics, and purchase downloads here. Visit them on facebook here.